Horace Wells was a compassionate dentist of deep religious convictions. In the aftermath of an especially agonising dental operation, he would sometimes stop work for several weeks, too traumatised by the need to inflict such terrible pain on his patients to continue. There were periods when he even considered giving up dentistry altogether. Fortunately, he persevered. By all accounts, Wells was a creative and successful dentist. From his office in Hartford, Connecticut, he popularised diligent tooth-brushing with the slogan, "The clean tooth does not decay!" 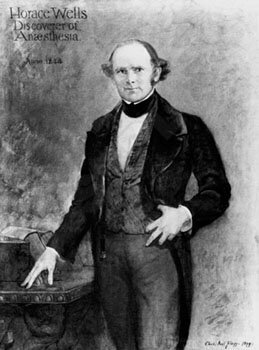 On 10th December 1844, Wells and his wife Elizabeth attended a stage-show laid on by "Professor" Gardner Quincy Colton. After watching an acquaintance, store-clerk Sam Cooley, injure his leg without batting an eyelid, Wells recognised that nitrous oxide might prove a godsend to surgical medicine as well as popular entertainment.
" At length Sam Cooley took the gas and proved to be an interesting subject. He careened about the stage in an extraordinary manner when suddenly he espied in the audience an imaginary enemy and sprung over the ropes and after him. The innocent spectator, frightened out of his seven wits, summarily abandoned his seat and fled, running like a deer around the hall with Cooley in hot pursuit, the audience on its feet applauding in delight. The terrified victim finally dodged, vaulted over a settee and rushed down an aisle, Cooley a close second. Half way to the front the pursuer came to himself, looked about foolishly, and amid shouts of laughter and applause slid into his seat near to Dr. [Horace] Wells. Presently he was seen to roll up his trousers and gaze in a puzzled sort of way at an excoriated and bloody leg..."
Wells decided that the first guinea pig should be himself. An erupting wisdom tooth had been troubling him for some time. This seemed the ideal occasion to remove it. Both Colton and Wells' partner Dr Riggs were initially reluctant to contemplate using the higher dosages of nitrous oxide needed to induce insensibility rather than intoxication and euphoric excitement. But Wells insisted. The extraction was a success. Wells enlisted Colton's help in teaching him how to manufacture and administer nitrous oxide to his patients. "A large number of students, with several physicians, met to see the operation performed - one of their number to be the patient. Unfortunately for the experiment, the gas bag was by mistake withdrawn much too soon, and he was but partially under its influence when the tooth was extracted. He testified that he experienced some pain, but not as much as usually attends the operation. As there was no other patient present, that the experiment might be repeated, and as several expressed their opinion that it was a humbug affair (which in fact was all the thanks I got for this gratuitous service) I accordingly left the next morning for home." Badly emotionally bruised, Wells didn't give up. He continued his attempts to promote nitrous oxide anaesthesia, even travelling to Europe in the hope of finding a more receptive audience. The Paris Medical Society took a sympathetic interest in his work and recognised his claim to priority. But by the time Wells returned to the USA, the surgical scene had shifted dramatically. Ether anaesthesia was firmly established thanks to a bravura performance by Morton in the same Massachusetts amphitheatre where his mentor had earlier been humiliated. Chloroform anaesthesia was vigorously under investigation too; nitrous oxide had been eclipsed. In January 1848, Wells self-experimented with chloroform for a week. He became addicted and increasingly deranged. One day, delirious, Wells rushed out into the street and threw sulfuric acid over the clothing of two prostitutes. He was committed to New York's infamous Tombs Prison. As the influence of the drug waned, Wells' mind started to clear. In despair, he realised the horror of what he had done. Wells then committed suicide, slitting an artery in his leg with a razor after inhaling an analgesic dose of chloroform to blot out the pain.